Awolowo University, Ile – Ife, Osun State, Nigeria. 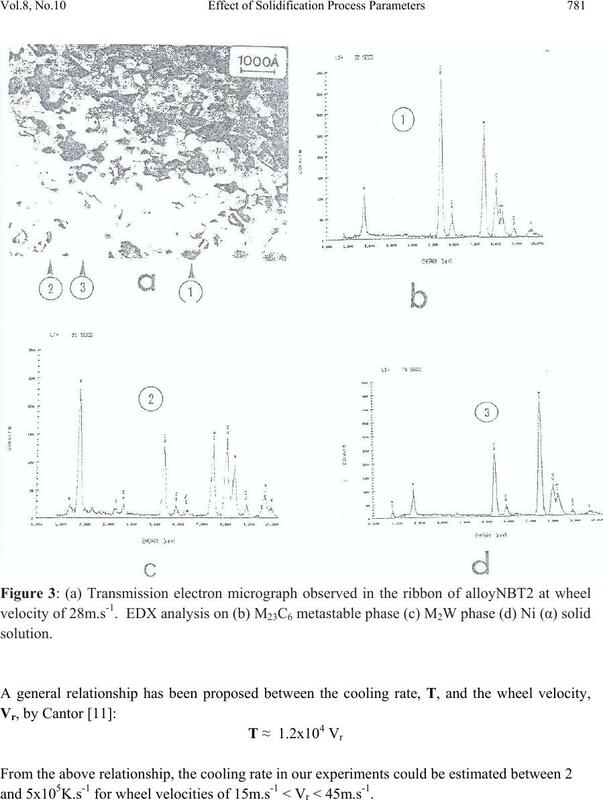 between the ideal and newtonian coolings was observed in all the alloys investigated. exchangers, turbines, tools, extruders, plungers, rolls for rolling mills, agriculture machinery, etc. 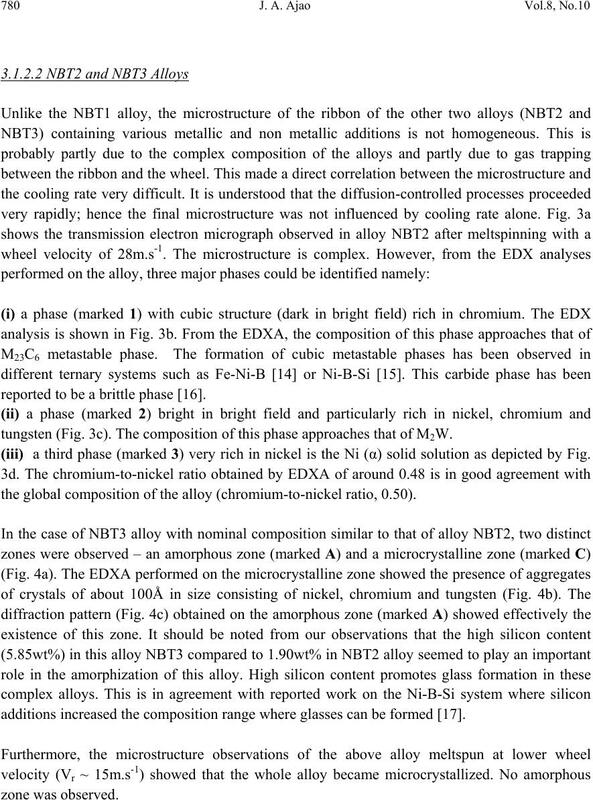 The nominal composition of the alloys investigated is presented in Table 1. 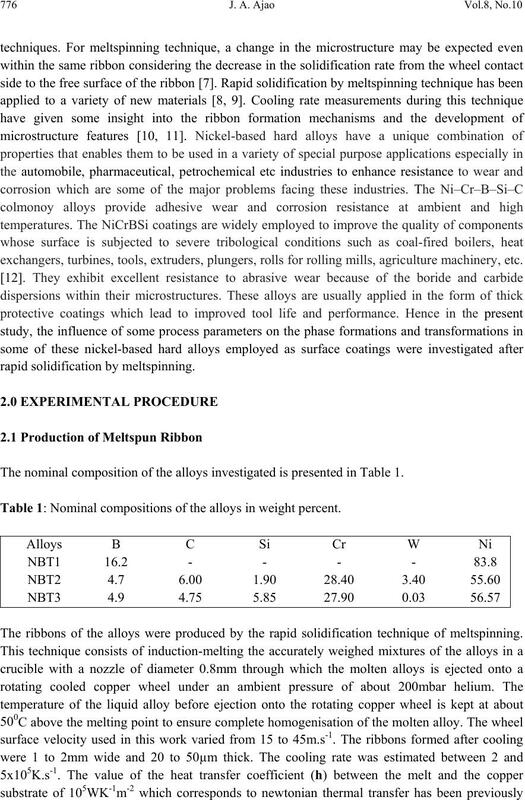 Table 1: Nominal compositions of the alloys in weight percent. The ribbons of the alloys were produced by the rapid solidification technique of meltspinning. optimisation of the ribbon quality is shown in Table 2. 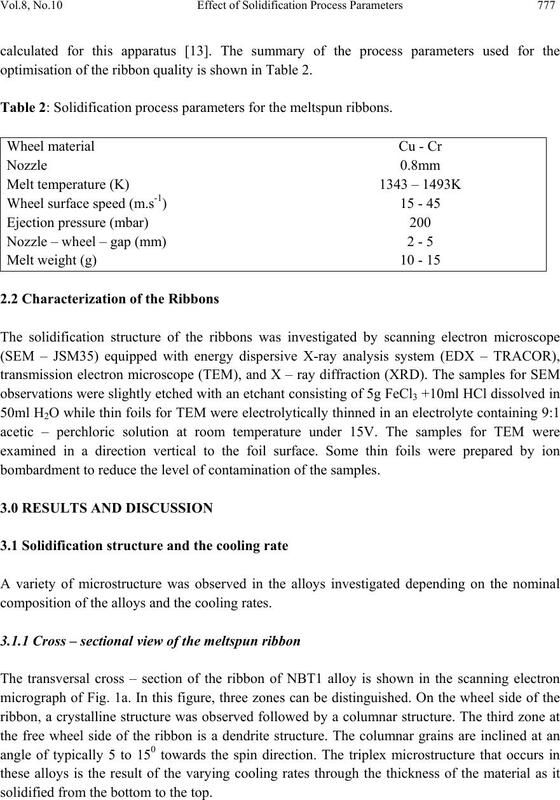 Table 2: Solidification process parameters for the meltspun ribbons. bombardment to reduce the level of contamination of the samples. composition of the alloys and the cooling rates. solidified from the bottom to the top. (b) Vr = 15m.s-1 (c) Vr= 28m.s-1 (d) Vr= 45m.s-1. 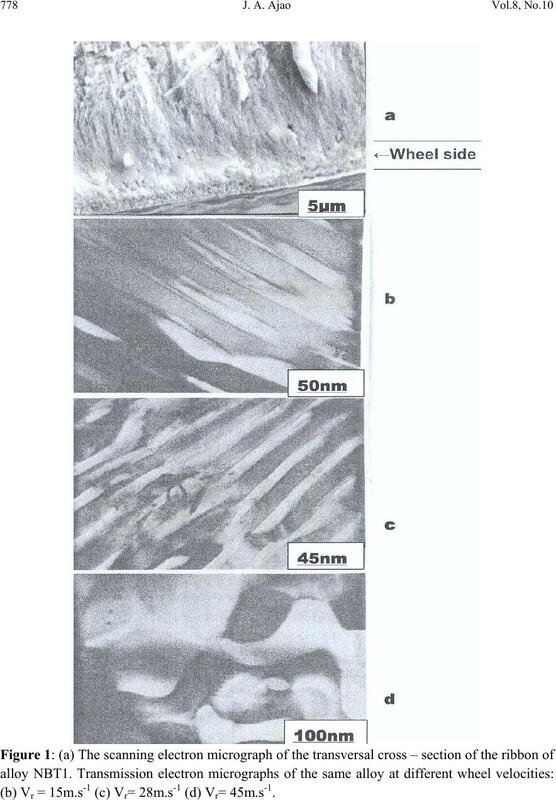 A detailed observation of these alloys was performed on transmission electron microscope. 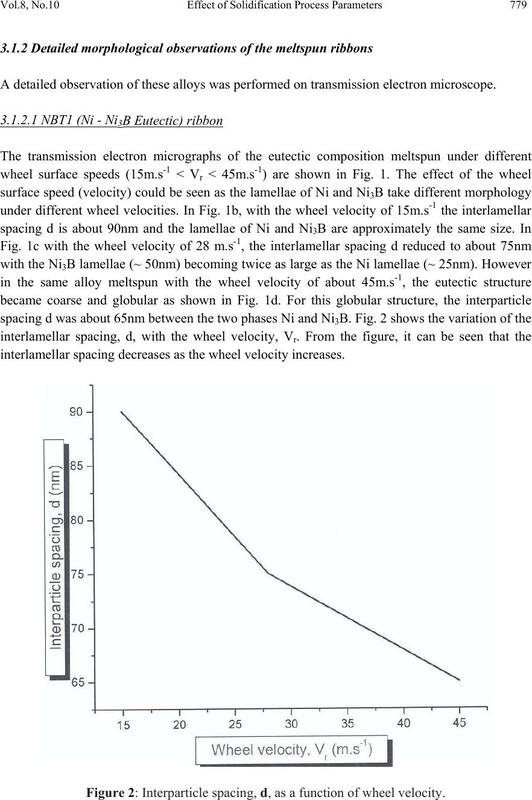 interlamellar spacing decreases as the wheel velocity increases. Figure 2: Interparticle spacing, d, as a function of wheel velocity. reported to be a brittle phase . tungsten (Fig. 3c). The composition of this phase approaches that of M2W. (iii) a third phase (marked 3) very rich in nickel is the Ni (α) solid solution as depicted by Fig. the global composition of the alloy (chromium-to-nickel ratio, 0.50). additions increased the composition range where glasses can be formed . and 5x105K.s-1 for wheel velocities of 15m.s-1 < Vr < 45m.s-1. 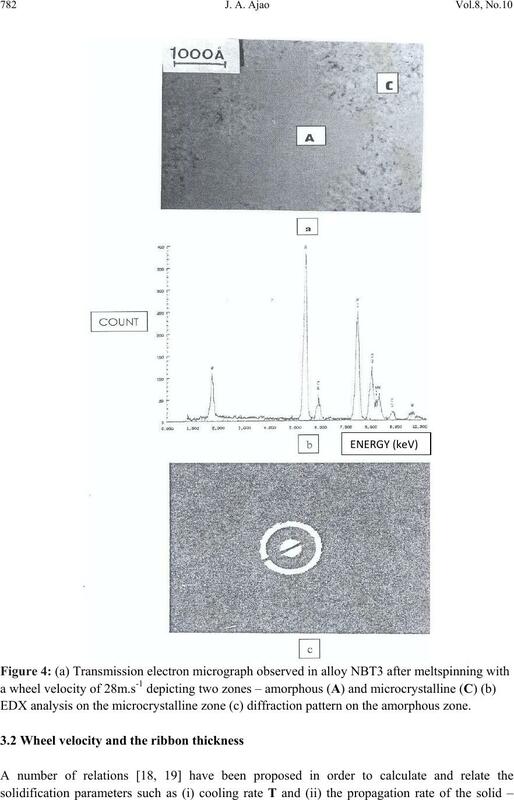 EDX analysis on the microcrystalline zone (c) diffraction pattern on the amorphous zone. transfer mode intermediate between the ideal and newtonian coolings. meltspun ribbons as a function of the ribbon thickness. microhardness weakly influenced by the ribbon thickness in the Fe – 3.2wt%C alloys. 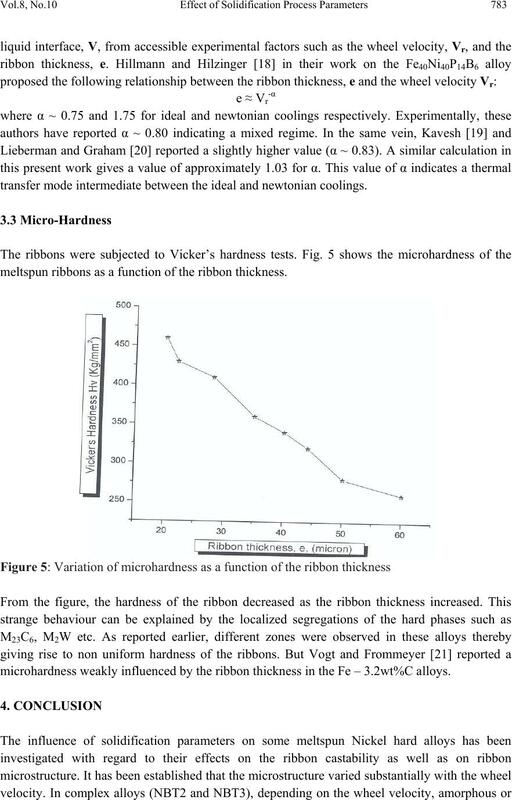 microhardness decreased as the ribbon thickness increased. him leave of absence during the preparation of this work. power diode laser”, Mater. Sci. Eng. A Vol. 334 pp. 233–238. 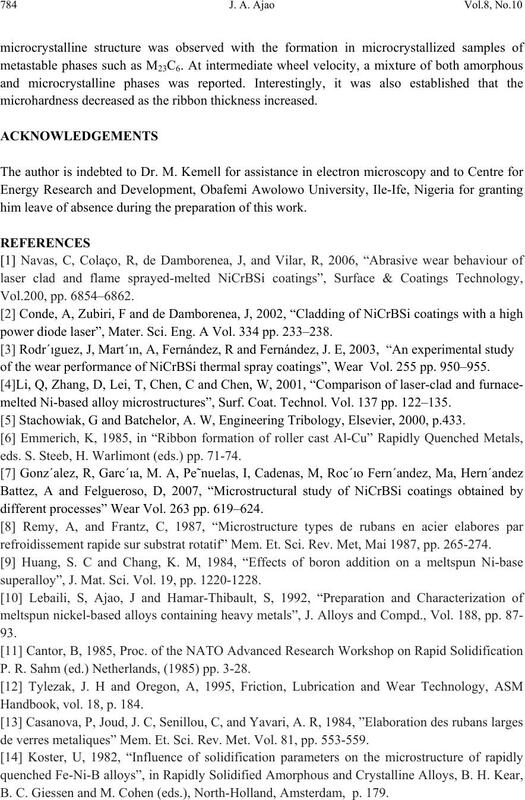 of the wear performance of NiCrBSi thermal spray coatings”, Wear Vol. 255 pp. 950–955. 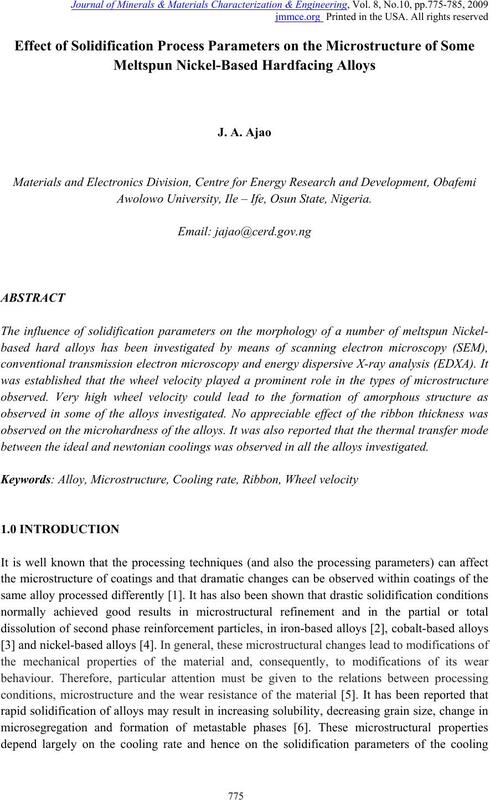 melted Ni-based alloy microstructures”, Surf. Coat. Technol. Vol. 137 pp. 122–135. Stachowiak, G and Batchelor, A. W, Engineering Tribology, Elsevier, 2000, p.433. eds. S. Steeb, H. Warlimont (eds.) pp. 71-74.
different processes” Wear Vol. 263 pp. 619–624. refroidissement rapide sur substrat rotatif” Mem. Et. Sci. Rev. Met, Mai 1987, pp. 265-274.
superalloy”, J. Mat. Sci. Vol. 19, pp. 1220-1228. P. R. Sahm (ed.) Netherlands, (1985) pp. 3-28. Handbook, vol. 18, p. 184.
de verres metaliques” Mem. Et. Sci. Rev. Met. Vol. 81, pp. 553-559. B. C. Giessen and M. Cohen (eds. ), North-Holland, Amsterdam, p. 179. 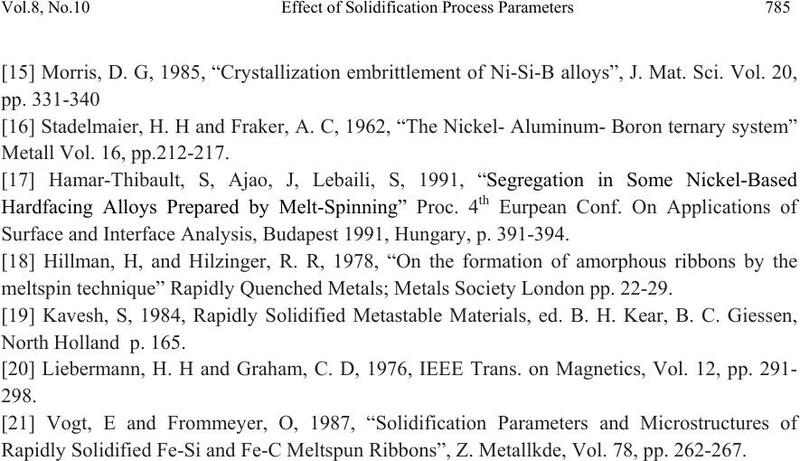 Surface and Interface Analysis, Budapest 1991, Hungary, p. 391-394.
meltspin technique” Rapidly Quenched Metals; Metals Society London pp. 22-29. Rapidly Solidified Fe-Si and Fe-C Meltspun Ribbons”, Z. Metallkde, Vol. 78, pp. 262-267.